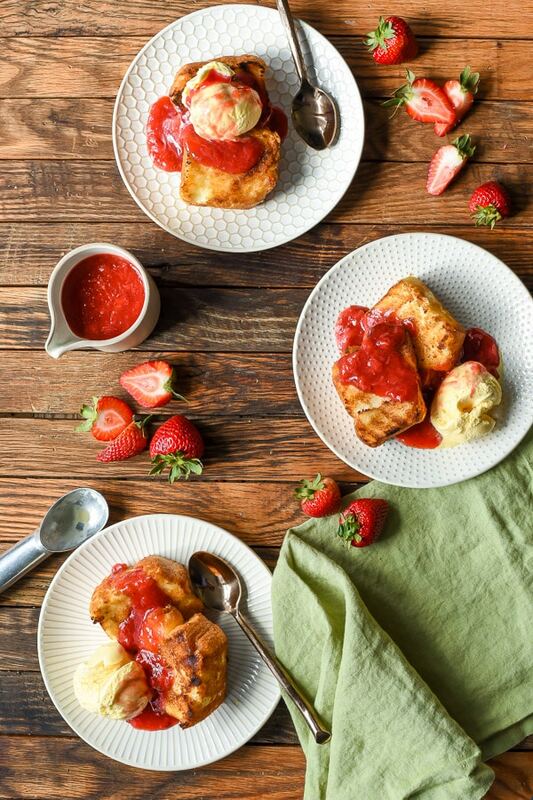 When life hands you crazy, make Grilled Angel Food Cake with Strawberry Rhubarb Compote. At least I’m pretty sure that’s how the saying goes. Life has been all kinds of topsy turvy for us the last few months. I haven’t shared a lot here on the blog, but among other things, my husband has been between jobs, we planned and started an entire first floor home demo and renovation, and then decided it’d also be smart to potty train our son in the midst of the chaos. Oh, and did I mention I’m also pregnant?! In case you missed the announcement on Instagram last week, we’re expecting Baby #2 in late October! I’m currently 20 weeks along and after a rough first trimester, I’m feeling pretty good. I’m tired, but it’s tough to know whether that’s pregnancy tiredness, chasing around a 2 year old tiredness, or living in a construction zone tiredness. We’re working long hours and waking up to the sounds of holes being drilled in the walls, but I’m beyond excited for all that is to come out of this crazy season. Our sweet P is taking all the changes like a champ, though he did ask “Is our house falling down, momma?” on the first day of demo! He also seems to be excited about the new baby, though he insists he wants both a baby brother AND a baby sister. Hopefully he won’t be too disappointed when we only bring home one baby this fall. My pregnancy nausea subsided around 15 weeks, and about the same time my sweet tooth came roaring back. I couldn’t even look at chocolate in the first trimester. Now I see a stack of fudge brownies and feel the need to cram them all in my face immediately. 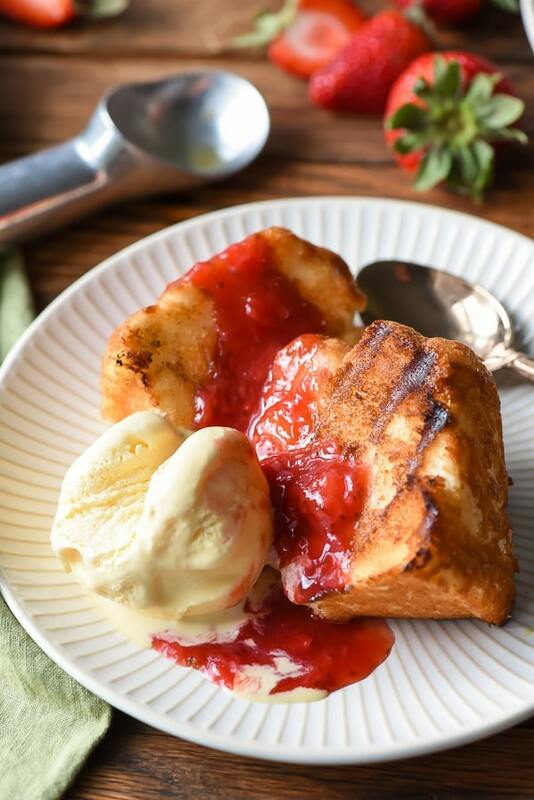 The renovation is keeping me from baking up a storm, but luckily I can still indulge in simple semi-homemade desserts like this Grilled Angel Food Cake with Strawberry Rhubarb Compote. 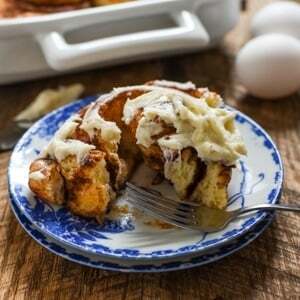 This killer dessert starts with a store bought angel food cake. The classic light and airy cake takes on a crispy, caramely exterior after being buttered and grilled until golden brown. It’s so good my hubby couldn’t resist eating a slice plain. 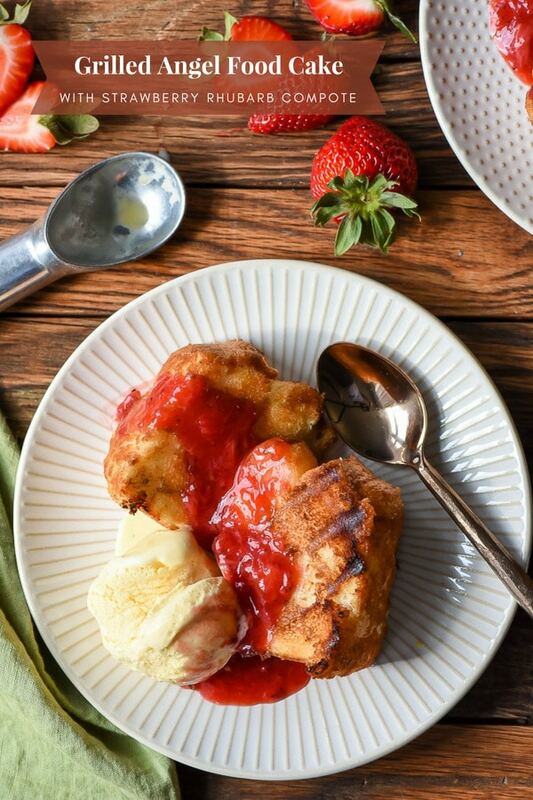 While the angel food cake gets eaten by my husband all gussied up, I like to make a quick stovetop strawberry rhubarb sauce to slather on top. You guys know the drill here–sweet strawberries + tangy rhubarb = always a win. I like to add a squeeze of lemon juice and vanilla to the sauce, then let it cook down until it’s ruby red, thick, and bubbly. Then comes the best part. Grabbing a slice of angel food cake, pouring the sauce in all the nooks and crannies, and then topping it off with a big scoop of ice cream. It is sweet summertime on a plate, perfect for fancy dinner parties or casual cookouts, and made in only 15 minutes. If you have leftovers, the compote stays in the fridge for several days and is great on pretty much anything. Try it in Strawberry Rhubarb Ice Cream Floats, swirl it into yogurt or pancakes, or just eat it with a spoon. I’m sure you’ll manage to finish it up somehow. Angel food takes on a caramelized flavor after a trip on the grill. 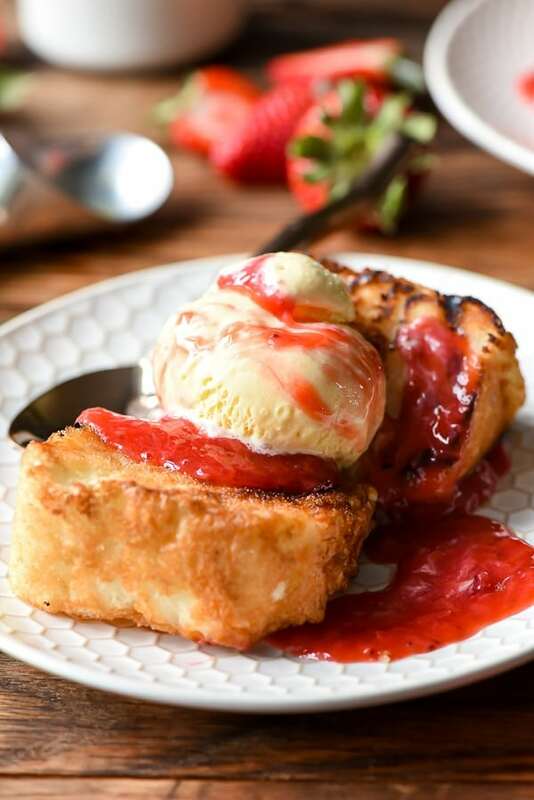 Smothered with a simple strawberry rhubarb compote and a scoop of ice cream, this is such a beautiful and delicious summer dessert! 1. Add strawberries, rhubarb, and sugar to a small sauce pan set over medium heat. Cook until rhubarb and strawberries begin to break down and soften, stirring often, about 5 minutes. In a small bowl whisk together cornstarch and water then add to berry mixture. Continue to cook until mixture is thickened and coats the back of a spoon. Stir in vanilla, ginger, lemon juice, and salt and cook for an additional 1 to 2 minutes. If desired, smash berries and rhubarb or puree in a blender for a completely smooth texture. I like to leave some chunks of strawberries, but feel free to do what you need to do! Keep warm until ready to serve. 2. Meanwhile, use a pastry brush to coat both sides of angel food slices with butter. Place on grill over prepared coals. Do not cover. Grill for about 1 minute on each side, or until slightly charred all the way around. 3. To serve, place slices of angel food cake on a plate. 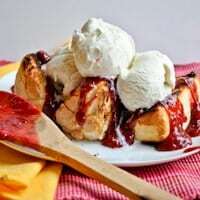 Top with warm strawberry rhubarb compote and a scoop of ice cream. Enjoy! You can easily double the compote recipe if you want to make enough sauce to use the whole angel food cake. Youre hilarious. I love the excitement (and use of parenthesis) in this post! I never would have thought to grill angel food cake but now I’m going to have to try! 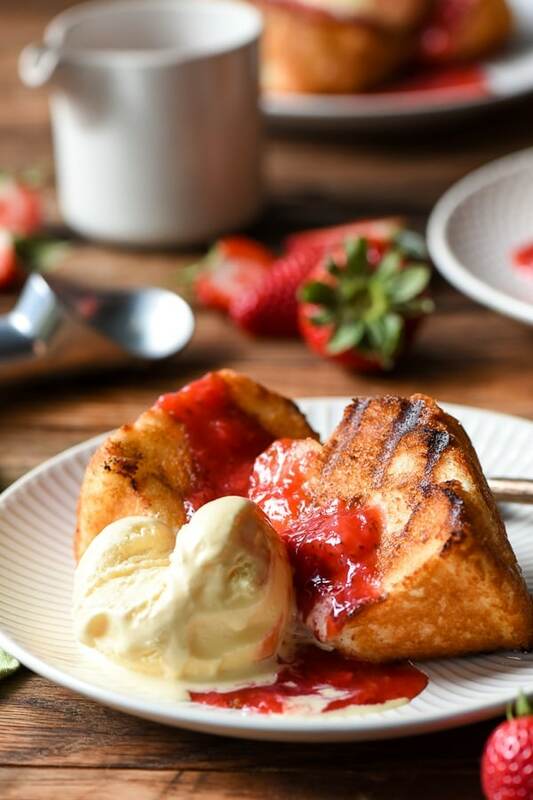 I’ve never seen a grilled angel food cake before…but I love this! OH MAN, I made this for our Memorial Day BBQ. Everyone loved it! The crispy grilled edges of the cake were oh so good. Yay! I’m so glad you liked it! Sorry rhubarb was so hard to find. 🙁 I usually get mine from Kroger or mom’s garden. I hear the stuff grows like weeds…I may have to try grqoing our own next year. I can attest that this was the bomb..since I was at the party :)Thanks Courtney for posting and Christina for making this. Delicious! Your recipe calls for ginger. Is this fresh ginger or dried? 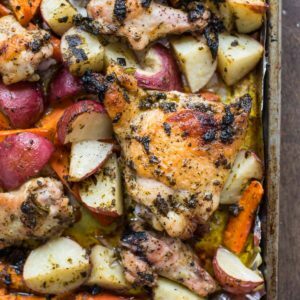 This recipe sounds delicious, cannot wait to try it! Your 2 year sounds adorable.